‍‍The month-long Perth Comedy Festival brings a line-up of the world’s biggest comedy stars and next-big-things to WA and 2019 sees the return of Englishman Stephen K Amos and Scottish lad Daniel Sloss who are set to perform alongside Aussie’s Nazeem Hussain and Tahir. Home-grown WA acts The Motherhood, Simone Springer and Colin Ebsworth round out this first announcement. Tickets to these shows go on sale as of 10am this Friday 16 November via www.perthcomedyfestival.com. A stalwart on the Australian (and international) comedy circuit Stephen K Amos (UK) is set to deliver an evening of brilliant favourites, classics and new material with performances at the Regal Theatre Thursday 9 May – Saturday 11 May (7pm). Internationally acclaimed award-winning Scottish stand-up star Daniel Sloss returns to our shores following his successful Netflix specials. If you like comedy with classically delivered punchlines then perhaps he is not the act for you. But, if you prefer your comedy delivered with dark humour and cynicism blended with a heap of jaw dropping reality, book your tickets to his new show “X” now and binge-watch Daniel Sloss: Live Shows to get you in the mood for when he takes to the Regal Theatre’s stage on Saturday 4 May (7pm). 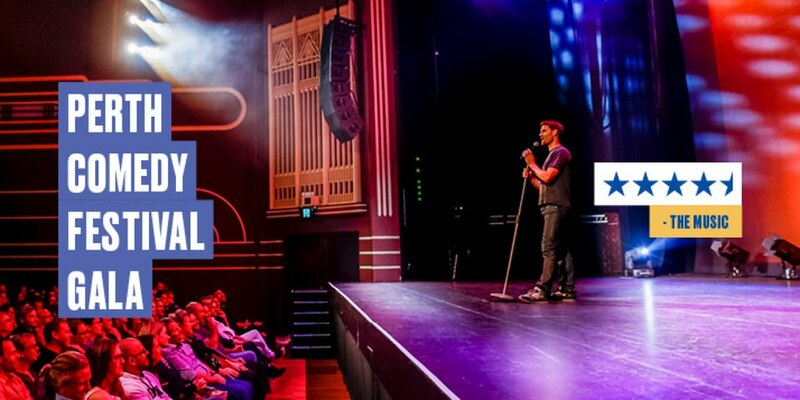 Comedian, host, broadcaster and all round funny guy Nazeem Hussain graces the Regal Theatre for yet another festival appearance. It’s been a huge year for Nazeem; he became a dad, his sketch show Orange is the New Brown began airing on Ch 7, he recorded his first Netflix special and was finally invited to speak at his high school assembly (Rex Hunt pulled out). Twice nominated for a Helpmann Award for Best Comedy Performer, you don’t want to miss his 5th consecutive solo show – “Basic Idiot”. Best known for his portrayal of Habib in the hit comedy TV show Fat Pizza, Tahir is also the creator of Here Come The Habibs (Ch 9) and has featured in Housos, Swift and Shift Couriersand The FOOTY Show. In his upcoming show “You Had ONE Job!” Tahir explores the stupidity of the funniest animal on the planet – Humans. Dumb jobs, stupid actions and hard to believe decisions from an animal that is apparently the top of the food chain. Don’t miss this world class award-winning comedian performing one night only on Friday 3 May (7pm) at the Astor Theatre. Laugh out loud with the local ladies behind The Motherhood who present “Surviving the Circus”Thursday 9 May – Saturday 11 May (7.15pm) at the Regal Theatre Chorus Room, perfectly timed for Mother’s Day. Featuring stand-up comedians Emma Krause (mum of twins), Pony (the FIFO mum), Simone Springer (the divorced diva) and Lucy Ewing (the silly mum), these witty women are set to deliver an extremely relatable show full of self-deprecating 5-star humour. The Motherhood’s Simone Springer will also present a solo show titled “Silence of the Labia”Thursday 2 May – Saturday 4 May at the Regal Theatre Chorus Room. It’s a comedy show that’s part quiz, part magic, part side show… and lady parts. And stand-up comedian and professional joke writer Colin Ebsworth returns for another festival performance with his show “Ebz Dispenser” on Thursday 2 and Friday 3 May (7pm) at the Regal Theatre Chorus Room. At just 26 years young, with almost a decade of stand-up under his belt, he’s Perth’s youngest comedy heavyweight and definitely one to watch! The ever-popular Perth Comedy Festival Gala is set for Wednesday 1 May at The Regal Theatre in Subiaco; the perfect stand-up sampler, the Gala presents the unique chance to see emerging and established comedians on the one bill and tickets are currently on sale.